The late Herb Adcox has been described as the “quintessential car guy.” He sold cars in Chattanooga for more than 60 years, only giving the game away two years before he passed away in 2015. 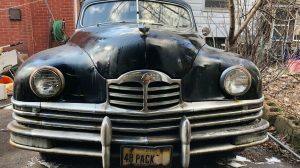 Our feature car formed part of Mr. Adcox’s estate, and you will find it listed for sale here on Craigslist. The car is located in Cleveland, Tennessee, and is offered for sale with a clean title. The seller has set a sale price of $11,500 for this Buick. Normally when I see a car advertised with a low mileage, I treat such claims with caution. Ultra-low mileage claims usually set off alarm bells. This particular Buick has traveled a claimed 3,000 genuine miles. This is a claim that I find to be quite plausible given the background of the car. Having said that, I would still hope that there is documentary evidence to back this claim. There is no doubting that the car is in amazing condition for its age. It is hard to find a flaw or fault anywhere on the outside, and even the vinyl top appears to be in good condition. Personally, I don’t think that the supplied photos do the external appearance of the car any real justice. It’s shots like this one of the interior that makes the mileage claims all the more plausible. Anyone who has ever owned a car with powder blue cloth upholstery can tell you just how quickly and easily it can discolor or get that dirty look. 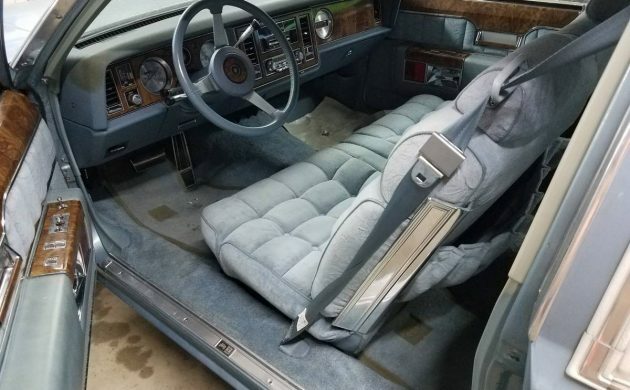 This upholstery appears to be close to perfect, and the whole interior appears to be exactly as the car was when new. 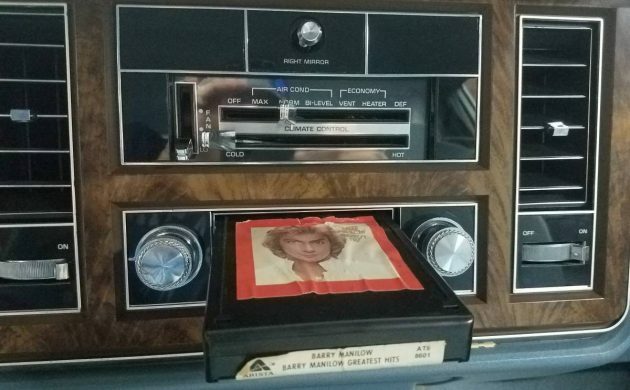 The original 8-track is still in the dash, and for your listening enjoyment, there is Barry Manilow’s Greatest Hits waiting to play for you. The seller also holds all of the original paperwork for the car. Under the hood is a 403ci V8 with a 4-barrel carburetor. This is backed by an automatic transmission. The car is said to run and drive as it should. 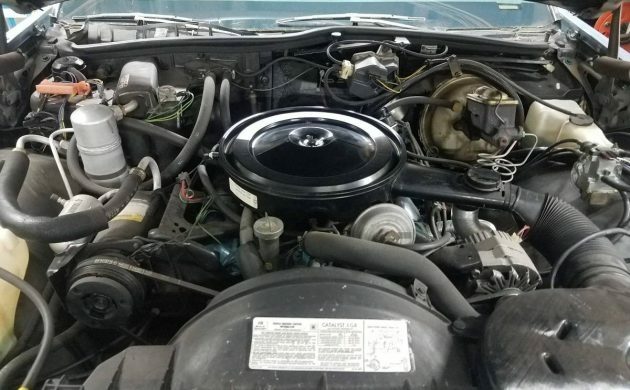 This Buick also features cruise control, air conditioning, power steering, and power brakes. This is another one of those cars where the seller has not gone ballistic under the hood with sprays and polishes and has left the engine in an honest state. That will always get a thumbs-up from me. This is one of those cars that poses a real conundrum for potential buyers. The asking price for this particular car puts it significantly above the market average, but that mileage puts it in a league of its own. 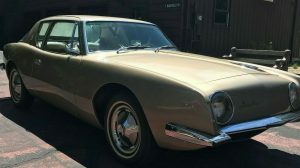 If you were to buy it, would you drive it sparingly and enjoy the experience, would you drive it regularly and enjoy it even more, or would the best place for this car be in a museum? Personally, I’d drive it sparingly and appreciate what it feels like to drive a new car that is 40-years-old. Another one to save because nobody really saved these. Also another one that looks like custom coachwork compared to almost anything made today. Great ride for period-correct eye candy in a movie/tv show set in that era. essentially a LeSabre coupe with a bit of flair to the rear these Rivs were no longer anything special. maybe they hadn’t been for awhile. we had an Olds 98 of this vintage with same/similar light blue quilted cloth & it always seemed silly to me how extravagant it felt & looked. still a gorgeous original example. somebody’s gonna save it, i hope. Second year for the B body Riv. 79 was a whole new car. Growing up, friends of my parents had the identical car. It was one of the few around town which made it even cooler. They eventually sold it for a new ’85 RX-7 GSL-SE, which I suspect was a mid-life purchase. I would drive that baby everywhere, and start collecting old 8 tracks. I still have all my old 8-tracks. Is that enough reason to buy this? No. It’s really sad how box-ugly Rivieras got. Seems more like a clean 103K mile car to me…….. Unless it was stored outdoors for awhile, 3,000 paint should be in better condition and so should the dash pad and floor mats. Unless there’s substantial documentation to back it up, it’s likely a 103k car. With it being from the Chattanooga area, I’m not surprised by the overinflated price either. Everyone there thinks they have gold when selling a car. But alas, it’s usually fool’s gold. The faded chrome around the instrument surrounds is a give away, with 3000 miles this car should be as close to new as possible, I’ve been in and seen real low mileage cars from the 70’s and even with the so-so materials they used back them a 3000 mile car should be pretty much new. Unless it was stored outdoors for awhile, 3,000mi paint should be in better condition and so should the dash pad and floor mats. Unless there’s substantial documentation to back it up, it’s likely a 103k car. With it being from the Chattanooga area, I’m not surprised by the overinflated price either. Everyone there thinks they have gold when selling a car. But alas, it’s usually fool’s gold. How do “Genuine” miles compare to “Original” or “Actual” miles? The seller is looking at that 5-digit odometer and thought surely it’s 3k Miles. It’s genuinely on the odometer! His interpretion is missing a digit, however. I can’t say that the guys thinking it’s 103K miles are correct, but the location raises a big red flag. Cleveland TN has been the home of cars that appear to have low mileage for many years. 60 Minutes even did a piece on it. J.T. Haun sold a ton of cars at the Butler Auto Auction in Western PA that showed and looked like low miles, even smelled like new. Everybody in the car business knew that everything he had were southern cars with high miles but detailed and looking perfect. And he was just one of a lot of locals doing it. My Dad bought a J.T. Haun car for my Stepmother, a 78 Olds 88 that showed and looked like 30,000 miles in the early 1980’s. We knew it had 130K on it. 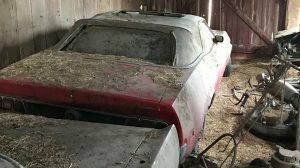 It ran rough at the auction, so he bought it cheap because he had a junkyard with several low mile 350 Olds motors. It turned out to be a vacuum leak (apparently J.T. Haun was better at detailing than replacing vacuum hoses) that made one cylinder miss, so she had it for 6 years and the motor ran fine when they sold it. Back in the late 60.s my step dad bought a white 1965 Buick Riviera and used to let me have it to go on dates and to the local ( Dixie drive in ) car hop hamburger joint. I was in heaven. Anyway, After the model year 1964 and 1965 The Riviera lost its classic clean line uncluttered styling. This 1978 Riviera looks like a modified Monte Carlo with just the front and rear ends restyled and badged Riviera. I don’t know about the miles I’m 50/50 on either side of that fence. It’s in stunning condition either way. People sometimes forget factory paint wasn’t as nice as megabuck resto paint. 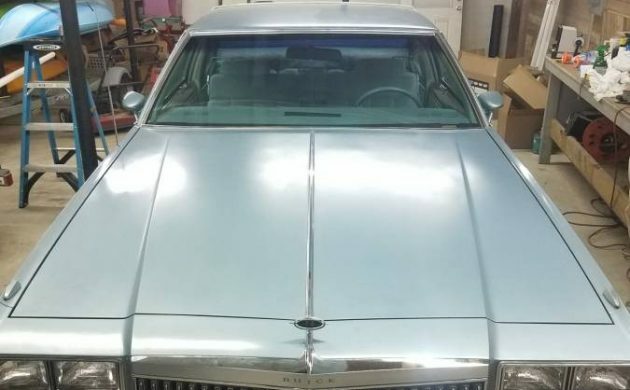 I at first glance thought 81 monte carlo when I saw it as the lines are very similar to the g-body. Were these RWD or FWD like the eldorado and toranado? I hope it finds a nice home, and prey it doesn’t fall victim to being “donked”. This would be a rear wheel drive model. The visual condition for it’s age is noteworthy and an abundance of luxury equipment make it a comfortable car to drive to shows and cruise-ins. It will never be a highly sought after collectible like a Mustang or Chevelle from 10 years earlier but is an awesome hobby starter car. Oh Riviera, look what they reduced you to. Still a nice car, but tis’ no Riviera. Aside from the engine, and that can get crusty from sitting, there really is nothing telltale that it has 103K. Knobs, pedals, door sills, seats all look low mileage. At 103K, those would all show some wear, no matter how meticulous someone cared for it. 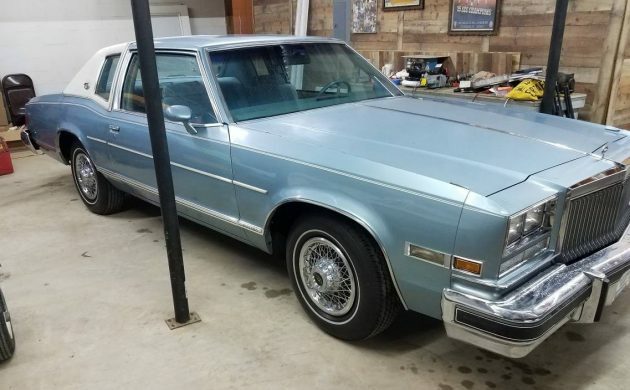 By 1978 Riviera was just a name, and you could probably get a regular Buick, similarly equipped for a lot less. Dad had a ’77 Electra 225 Limited 4-door with HD suspension. That was a real treat to drive. His company also had a fleet of Delta 88 2-doors that were nothing special at all. I wonder which driving experience would be closer to that of the LeSabre-based Riviera. I wonder about the mileage listed as well. I know the paint quality was terrible for many years with GM. The corner of the dash looks funky and it almost looks like a shadow of some sort. In my opinion too much money. I worked for a company who was a vendor for Herb Adcox Chevrolet. This vehicle sat in the show room for several years on and off. It was in excellent condition during this time frame. Herb Adcox was a very honest man, mileage is probably very correct. Please explain the considerable discoloration & crud on the speedo & fuel gauge bezels w/such minimal miles. Chrome plated plastic. Just like Botox, it’s the age not the miles. I would believe it’s the original mileage if you saw or knew the car. I didn’t know that Herb Adcox was a Chevy dealer. A Chevy dealer is a whole less likely to do something shakey than a used car detailer, roller, and flipper. But the locals in Cleveland TN were known so well for odometer roll backs in the 1970’s and 1980’s that CBS did a piece on them, so I had to point that out. It’s a nice car one way or the other. 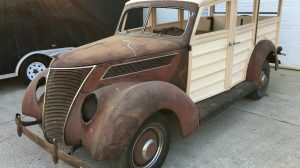 Missing two options – 4 wheel disk brakes and leather interior. My mom had a ’77, red w/white landau and white leather. It was a handsome car – had 4WDB with a cool emblem on the rear fenders. 3000 miles????????????? ?besides what others have mentioned, why would the storage pocket behind the front seat be all stretched out? Anyway I had one of these Rivieras when they were new in a burgundy with white top, for about 2 months……..was possibly the most useless Riviera (totally useless for wintertime driving where I live) and worst looking they ever made in my opinion…was little more than a Buick Le Sabre Coupe with different emblems and top in my book. Paint has great luster, interior is mint (no dash discoloration, chrome plastic around gauges is as-new…. oh and it’s got 10x the miles as the Riviera! The Riviera May indeed have only 3k miles but it’s condition doesn’t back it up. Granted, green may not be for everyone but this Electra is a better buy and once you look at them back to back- it’s obvious how awkwardly styled the Rivi is…. If this is a 3k mile car, what do you do with it? It’s not a very collectible Riv to be sure, and it’s only real draw is the low miles. Plus get ready to replace all soft rubber suspension parts, gas tank, fuel lines, etc. etc. etc.